We’ ll get an early start, after breakfast (included) and checkout, then head north, travelling through the changing countryside. 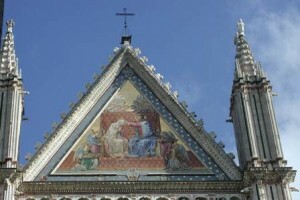 We will pass Naples and Vesuvius, then Rome, before stopping for the night in the dramatically perched town of Orvieto. Surrounded by vineyards and olive trees, Orvieto is home to a magnificent cathedral, which we’ll explore before becoming acquainted with the cobbled streets, intriguing museums, and architectural distinctives of the town. An alfresco dinner (included) will be our introduction to the delicious cuisine of the area. A restored palazzo will be our resting place for the night. Orvieto’s glorious cathedral crowns the inviting hilltop town. Breakfast (included), then we drive north to our base for the next three days, the historic town of Monte San Savino, where our lovely historic palazzo lodging awaits. After a quick stop to drop our luggage, we’ll wind through picturesque countryside to Italy’s most perfect medieval city, Siena. From the shell-shaped campo, one of the world’s most beautiful squares, and its impressive Palazzo Publico, to the superb Gothic cathedral, we’ll become acquainted with this beautifully preserved town. After a day of discovery, we’ll return to Monte San Savino for a delicious dinner of Tuscan specialties (included). Breakfast (included), then we’re off to gorgeous southern Tuscany, and the world-renowned vineyards of Montepulciano. 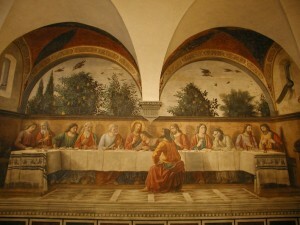 We’ll be welcomed by a vintner, and have the opportunity to taste and buy Vino Nobile di Montepulciano. This ruby vintage has been renowned for centuries, and was a favorite of Thomas Jefferson. We’ll explore the hilltop village of Montepulciano, and then proceed to another lovely Tuscan town, Cortona. We’ll take some time to explore the town, and enjoy the beautiful Fra Angelico masterpieces in an intimate museum before another delicious dinner (included), this time at the locally popular Osteria Del Teatro. Breakfast (included), and a day of discovery in the bustling, art-filled birthplace of the Renaissance, Florence. Churches and museums overflowing with masterpieces, shops offering leather goods, gold jewelry, and exquisite paper goods, the Arno river flowing under historic bridges – so much to enjoy in a day! After a relaxing dinner in a favorite trattoria (included), back to our lovely lodgings in Monte San Savino. Breakfast (included), and transportation to Florence Central Train Station, or more adventures on your own!